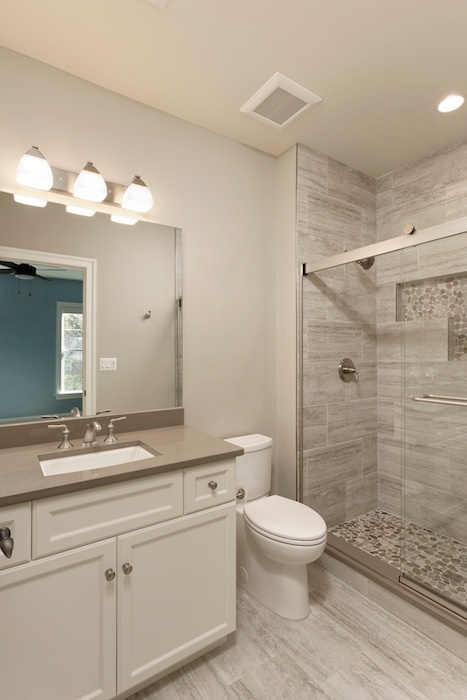 Choosing bathroom tile that reflects your personality and style is easier than ever. No longer are you stuck with plain white squares. The newest trends are all about mixing color, size, pattern and texture to create a look that is uniquely YOU! 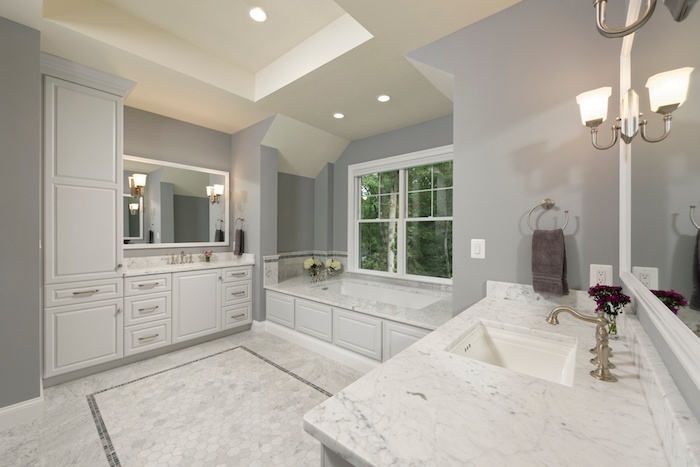 If you're planning to remodel your bathroom, or if you are designing a bathroom for your new custom home, check out these 10 new trends in bathroom tile design for inspiration. Forget boring. 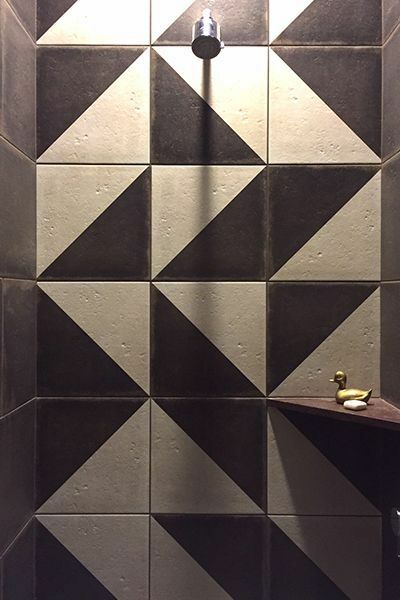 Make a statement by using geometric shapes for a custom look in your bathroom. Especially popular now is hexagonal tile, as shown in the photo below. 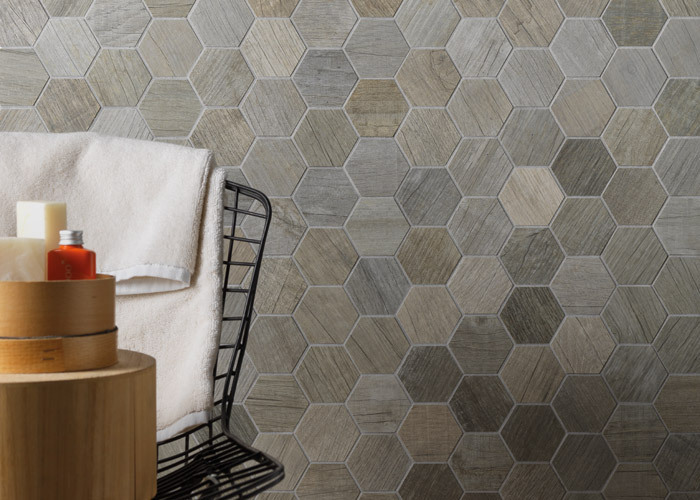 Geometric tiles can be used for flooring, on an entire wall or as a strategically placed accent. Choose neutral colors if you plan to use geometric shapes on a large scale so that the pattern is not overwhelming. Subway tile is a classic, but these days it can be found in a variety of materials, colors and sizes. 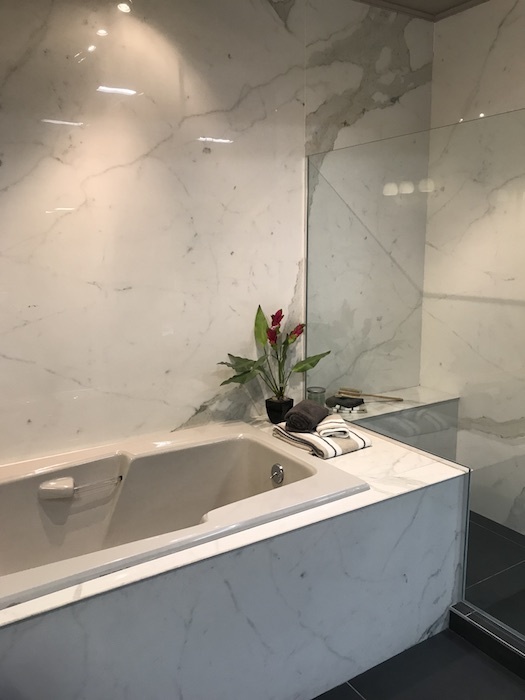 Since marble has gradations of color and also has an intrinsic pattern, it offers a new twist on the traditional look of porcelain subway tile. Combine marble subway tile on the walls of a shower with a geometric pattern on the floor, and you've got the best of two new trends! The natural look is in. 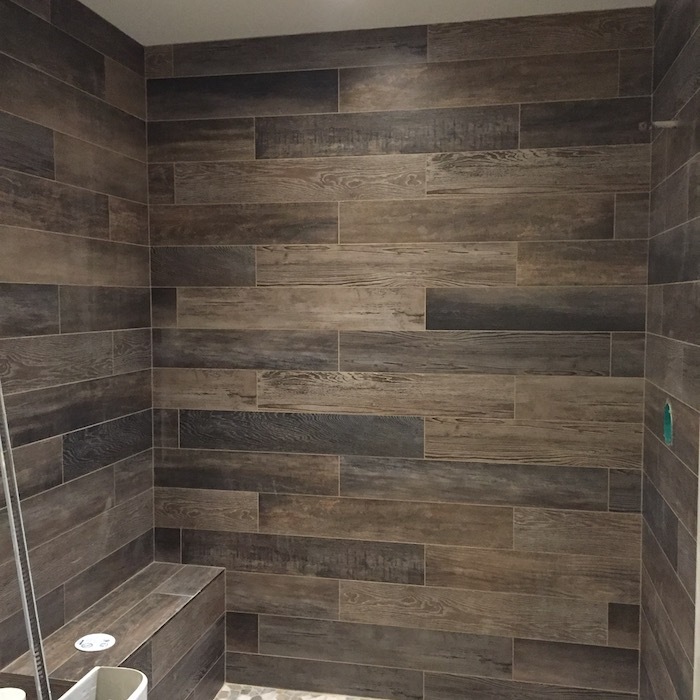 Porcelain tile that looks like wood can make your shower look like a sauna, but you won't have the maintenance headaches that come with using the real thing. Tiles with a wood-like grain are available in long planks or in a variety of shapes that can be used as earthy-style accents. 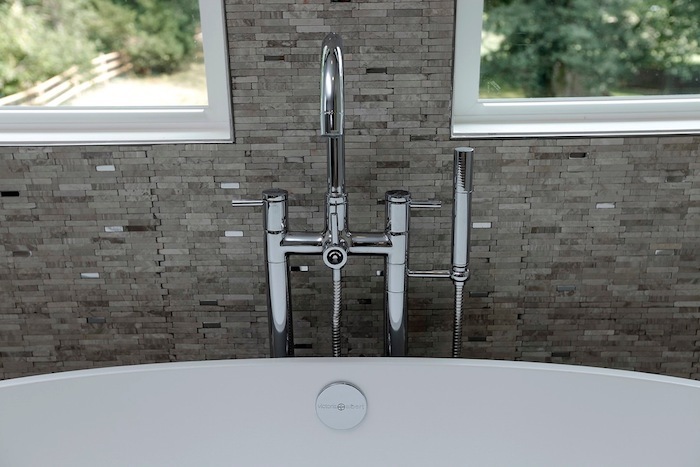 Another take on the natural look is using tile that has the appearance of river rock or other stones. This type of tile adds texture and dimension, and is perfect for a shower niche or floor. The Art Deco look of black and white is back, but with a modern twist! A color-blocking pattern, as shown below, offers a distinctively contemporary edge to this time-honored style. Applying an antique finish to the tile creates a matte look that has an air of elegance, and it is a design technique that is gaining popularity. 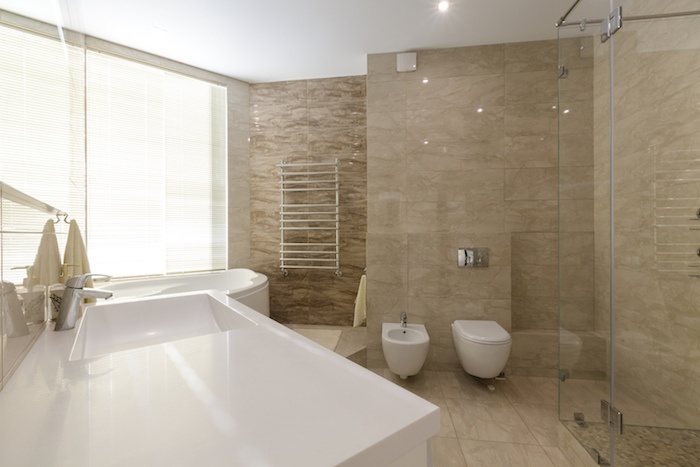 Want a tranquil, spa-like feel to your bathroom? Stick with neutral hues like gray and white. Patterned floor tile with a mosaic border adds sophistication to the space. Gray and taupe tile is always in demand, but color is now in-vogue, too. Blue, green and aqua - from bright to muted in tone - are the colors that are trending these days. Use a bright pop of color to liven up a space and show off your fun side! 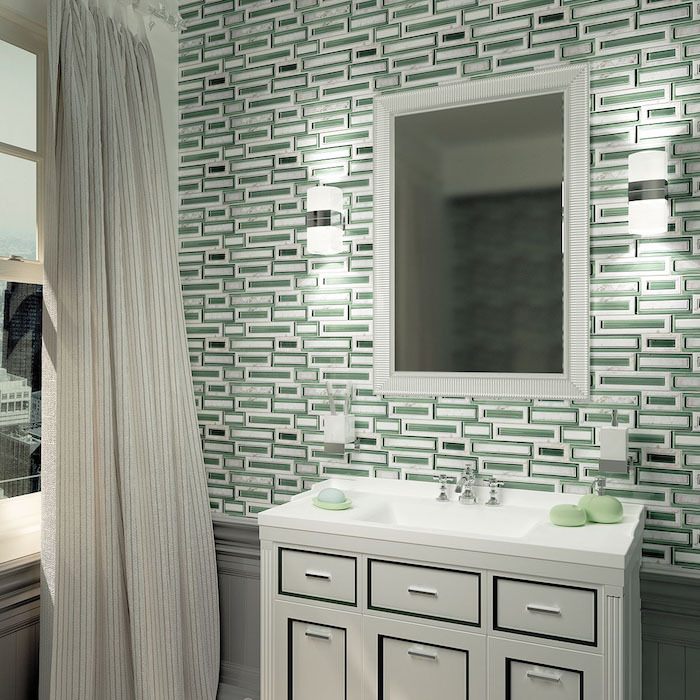 Shimmering mosaic tiles add a subtle glamour to a bathroom. Used sparingly, these metallic accents sparkle and reflect the light. Large format porcelain tile is very on-trend. 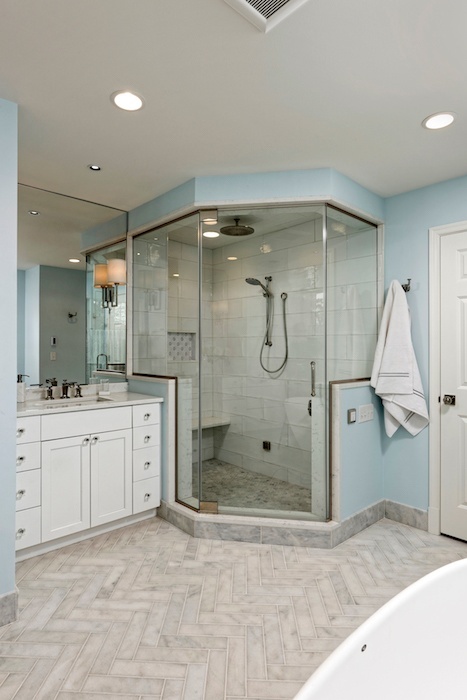 Slabs can be used as a tub surround, in a shower or to cover an entire wall for a seamless, ultra-contemporary look. Not only does it offer understated elegance, this type of tile needs minimal grout and is easy to keep clean. Mixing materials and patterns creates visual interest, but don't overdo it. Make sure that the sizes of the tiles used in different applications vary, that the scale of each type of tile works together and that you stick with the same neutral hues throughout the space.